Turkey’s LGBT communities and their supporters will be flying the rainbow flag high as Istanbul’s 19th Pride Week kicks off Monday. A week of events will be capped by next week’s Pride Parade, during which thousands will march against discrimination. The Hürriyet Daily News talks to event organizer Rüzgar Gökçe Gözüm about the week’s history. June is Pride Month in many countries as LGBT communities the world hold events in time with the anniversary of the 1969 Stonewall riots that kick-started the gay rights movement in the United States. It was not until Pride Week’s 10th anniversary that the event closed with a parade. 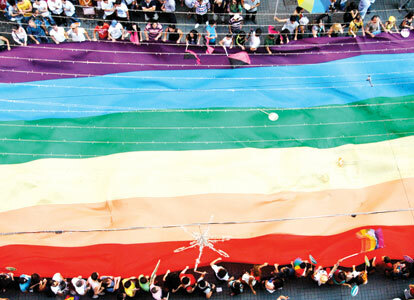 “The first Pride Parade took place on İstiklal Avenue with the participation of not more than 30 people. But the number increased exponentially each year, with around 5,000 people gathering and marching against homophobia and transphobia last year,” Rüzgar Gökçe Gözüm, a volunteer both for lambdaistanbul and an organizer of Pride Week, told the Hürriyet Daily News.